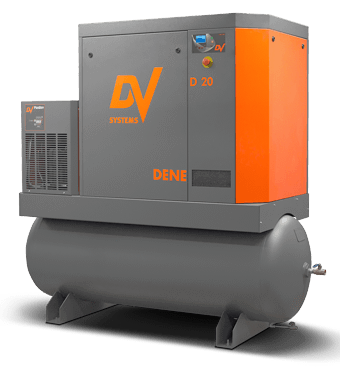 The 20HP Variable Speed Rotary Screw Compressor by DV Systems is a robust and reliable air compressor. The VSD minimizes in rush current and allows the air production to meet air consumption thereby eliminating artificial demand. It is available as a compact base mount unit or as a tank mount with refrigerated air dryer. At only 71 decibels this quiet compressor is perfect for any production floor or shop. DV Systems is a Designer of High-Performance, High-Efficiency Air Technology Solutions. They have been engineering and manufacturing industrial air compressors since 1954 and their commitment to a culture of innovation dates back 100 plus years.